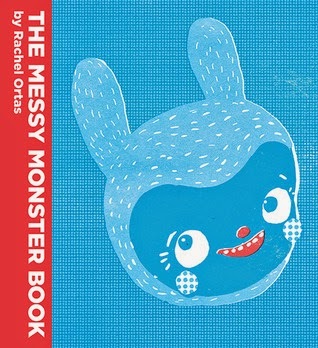 The Messy Monster Book by Rachel Ortas had me with the title alone. 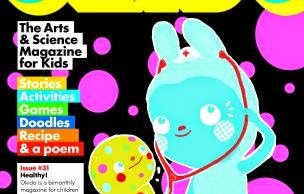 Even better, I discovered that Ortas is the co-creator and Creative Director of OKIDO, a very cool art and science magazine for kids. Follow the link above and you can see a sample of the bi-monthly, which is packed with activities (experiments, songs, recipes and crafts using cutouts from the magazine and found items) and stories for creative kids and parents and, of course, Ortas's fantastic illustration style and mascot Messy Monster, who you can see in super cute animated form in a video at the end of this review. 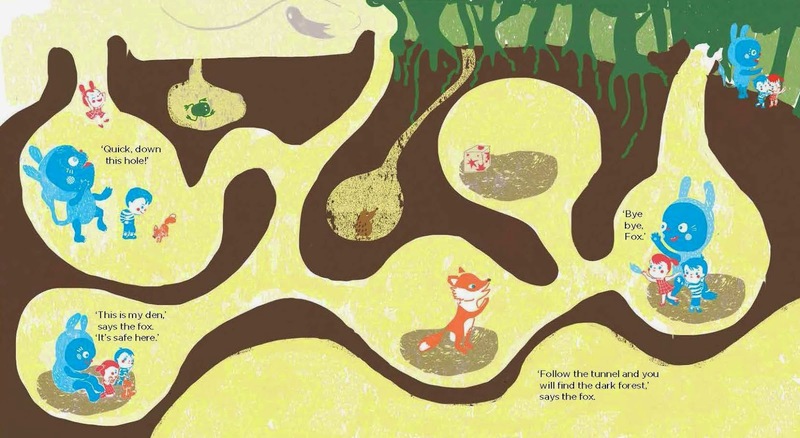 The Messy Monster Book is interactive, with pages to color and even cut out, but it is also a story with a narrative. Messy Monster and (human) friends Zoe and Felix invite readers to use their imagination and jump right into the book by adding a self-portriat to the page, as seen below. Platoo, Doodle Cat and Cutty Cat guide readers through the book with Platoo, who says, "Together we are going to think about things ... lots of things," poses thoughtful questions, wondering if it is lying to tell imaginary stories and noting that sometimes something that looks ugly to one person looks beautiful to someone else. 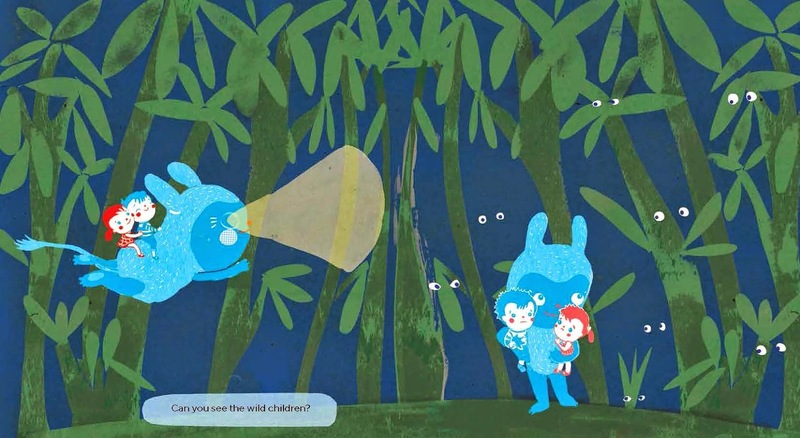 Messy Monster, Zoe and Felix take a swim to Kiri Kiri Island where they learn that the inhabitants can't dream anymore - they only have nightmares. And now they are exhausted. To this, Platoo says, "We are all scared of something. Sometimes being scared is a good thing because it protect us from danger. But sometimes we are scared of things that can't even hurt us. We are just scared of being scared!" 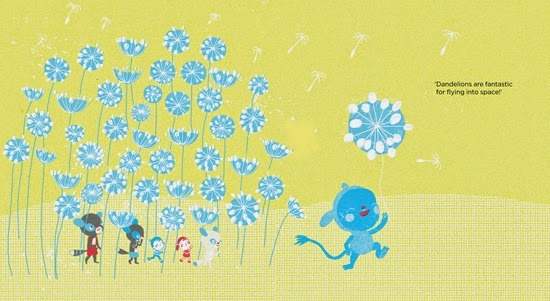 Like the illustrations in The Messy Monster Book, the story is a curious mix of playful oddness, retro-cute, surprising thoughtfulness. Messy and his mates travel to the planet of the Dreaming Mountains where readers have the opportunity to draw their nightmares and their dreams and shadows chase away the muse and the musical cat falls asleep and the children run wild. There is a baobab tree as well. But everything is right in the end and it's a lot of fun getting there. 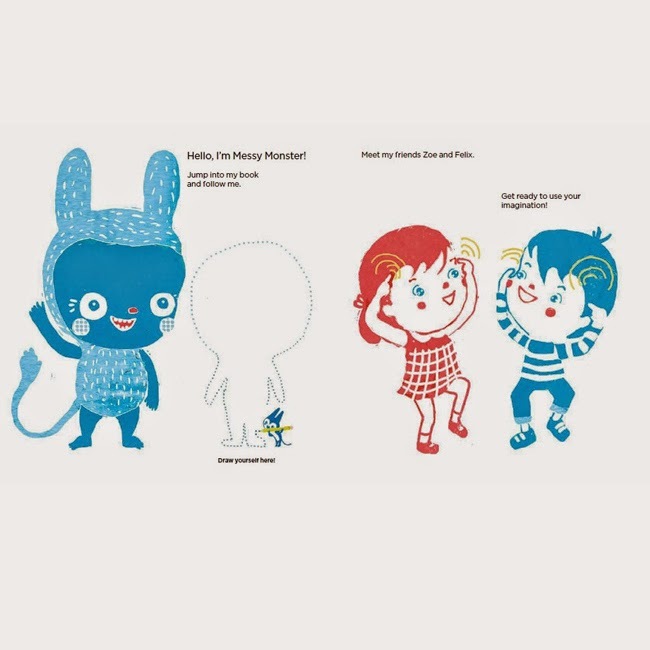 The Messy Monster Book is the kind of book that makes a perfect gift, it's so out of the ordinary. Now I just need to get my hands on a copy of OKIDO! Okido Trailer from Squint/Opera on Vimeo.